Prior to this trip, the furthest I'd ever driven in one go was 150-ish miles travelling to VW meetings around the U.K. 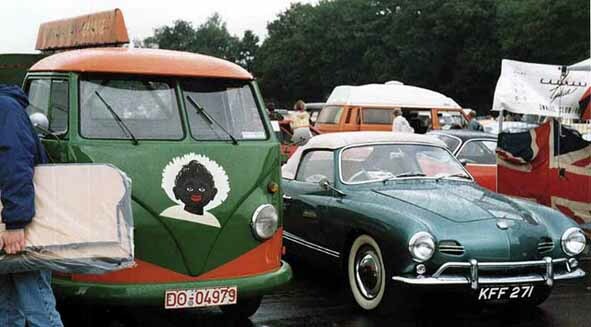 The International 'Euro VW Meet' in Venlo on the Holland/German border seemed like the ideal opportunity to take Splitty on what I assume is his first holiday abroad, and also to cure my envy of the intrepid Inuvikers. We decided to make a holiday of it and stop in Amsterdam for a couple of days on the way. Here we are at a road-side loo outside Calais, the ferry port in France. big tool box containing breaker bar, grease gun, Maglite, etc. & standard spares like fan belt, points, spare cables etc. By some miracle (or just exceptionally good 'busma') I only needed to use the petrol can and the oil. As we crossed the border into Belgium the road quality decreased dramatically. There were great big holes & piles of tarmac on the motorway!! The noise riding in the bus at 50-60 mph was deafening, overridden by a steady thwump-thwump-thwump as we drove over the 'seams' in the concrete. By about 4pm my eyes were drooping so I allowed Damon the honour of driving the bus. We got lost in Brugge. Belgians cannot build roads, neither can they erect helpful signposts (Sorry, Belgians). Eventually we found the right road. I got back in the driving seat and we decided to press on out of Belgium and head for Amsterdam for the night. Amsterdam was brilliant. We spent most of our 2 days there in museums (the Van Gogh museum was superb, a temporary exhibition of American Watercolourists in the Rijksmuseum was even better). We also had many fantastic beers in great pubs with chubby cheerful barmen. We saw very very few aircooled VWs outside the VW meeting. But Amsterdam was positively crawling with old Citroen DS's and Fiat 500's. 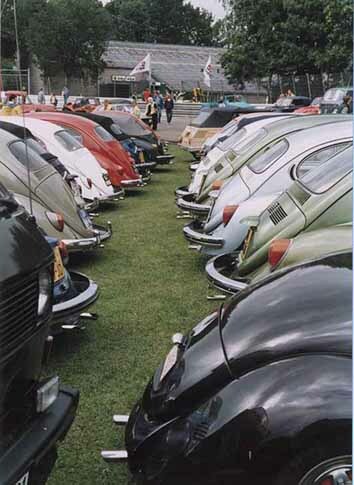 Venlo's VW Euromeet - the main event of the trip. I met Glen and Lene Swanson via the type2 mailing list. Immediately on arriving at the Venlo showground, Glen strode up with a beaming face, shook my hand and said "you must be Sarah!". We all got on really well, and hope to meet up again sometime. 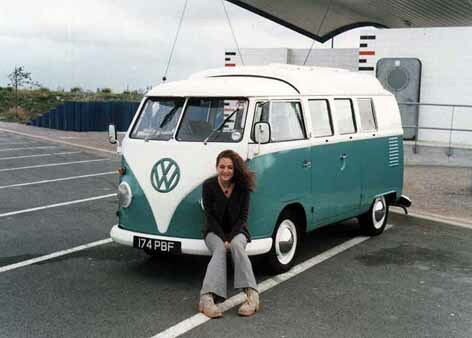 Lene's '61 bus is absolutely stunning - in fabulous original condition, with all original panels. 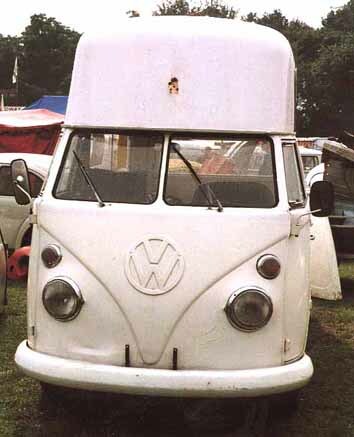 Glen & Lene's daily driver is an oval beetle and the '60 bus is for weekends. From left to right: Glen, Damon, Lee (of 'Samba Server' fame), and Lene (hidden behind Lee). You can just see the rear corner of Glen & Lene's bus on the far right. I'm taking the photo after one beer too many judging by my focusing skills. This is the main drive- / walk- way down one side of the showing/racing area. People were thrashing priceless old beetles down the 'drag strip' (one side of the oval-shaped track). The sole safety measure was a huge pile of sand at one end.... behind which punters were blithely wandering... mad! No pics of this, sadly. Pick-up truck with orange-seller signwriting, and a beautiful Ghia from England. 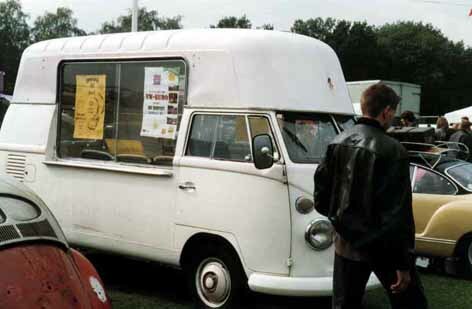 VW ice cream van, now in hot-dog van livery.